Rafa had his pre-tournament press conference Saturday. Here is the transcript and a few pictures. Q. Could you let us know how you feel and how much practice you've been able to get in since you arrived in Melbourne? RAFAEL NADAL: I'm feeling better. I think not perfect yet. But, yeah, seems like after what I had in Doha, when I practicing, I feel a little bit more tired than usual and sweating more than ever. But the true is I'm better than few days ago. So that's very positive. I hope not going to be a problem for next Monday or Tuesday. I don't know yet. So happy I am able to practice every day normal time. So is nothing special. I practiced like I did all my life. Q. You said you didn't have a long break. Does it feel like the beginning or the end of the season, this tournament? RAFAEL NADAL: For sure the beginning. We're in 2011. 2010 is past. For me is the beginning for sure, no? I didn't stop. But this year everything starts another time. So very happy to be here in Australia another time. Always very good news be here. Yeah, is true, I didn't have a break. So hopefully if I have a good result here, I gonna have a few weeks after here. Q. Do you feel any extra pressure going for the four slams in a row? RAFAEL NADAL: For sure, no. That's true, maybe I only going to have this opportunity in my career. But not for that reason I going have the pression. The pression is like every Grand Slam, you want to play well in the important tournaments. And for me, have the fourth or not is something that is not in my mind. What is in my mind is try to play well, try to start the season playing well another time, and we will see what's going on. It's very difficult to think about that when we didn't start the tournament, playing a very difficult tournament like this one. Q. How do you explain that it hasn't happened for such a long time? 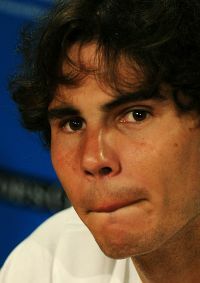 RAFAEL NADAL: I think is almost impossible. Is very, very difficult, no? The tennis is a very competitive sport and is not a lot of difference between players. So a lot of matches decides in a few balls. So for that reason is very difficult to have one player winning everything. That's the true. So I think that's the reason. Q. Can you tell us how special it would be, regardless, to be able to take out the four? RAFAEL NADAL: I think is better if we continue with another questions because for me, seriously, I can't answer this question because I didn't imagine (laughter). I think if that's happen, for sure for me I gonna be more happy to win in Australia because is the Australian Open more than is because the fourth in a row. That's hundred percent true. Q. When Federer was in here earlier, he said you should be the favorite for the tournament because you won the last three Grand Slams. Do you feel the same way? RAFAEL NADAL: No. For sure no. Yeah, every tournament is completely different. I gonna try my best to play well. And we will see what's going on, no? But I feel if I play at my best level, I can have a chance to be in the second week, and there we will see what's happen, no? Every match will be really difficult, so I have to be ready for everything. But I for sure am feeling less favorite than him and not more favorite than Djokovic, Murray, Soderling, these kind of players, no? So that's true. That's what I think. Q. How is it possible that two players are dominating the circuit as you and Roger have the last years? RAFAEL NADAL: I don't know. I don't know. Well, he made a little bit more than me. That's the true. But I don't know. I think that's difficult. That's something gonna be not easy to repeat, but I don't know how is the tournaments. But in more than 20 Grand Slams, only two or three players won a Grand Slams, I think that's impossible to continue like this. I think that's not going to continue like this. We will see what's happen, no? But there is a lot of good players, a lot of young players, and every year is more and more difficult. Q. Your fellow No. 1 on the women's tour, Caroline Wozniacki, is coming into her first tournament as No. 1. Can you talk about the pressures coming into the first Grand Slam as No. 1? RAFAEL NADAL: I don't think she need my advice, no? But at the same time, seriously, for me doesn't matter if I'm No. 1, No. 2 or No. 5. When you arrive for play a tournament, the goal is to play well and try to play a good tournament, have a good result, and if is possible win. Doesn't matter if you are No. 1 or No. 5, the pressure is the same because in the end your goal is the same if you are No. 1 or if you are No. 5. Q. Do you see her winning a Grand Slam in the very near future? RAFAEL NADAL: I thought he [sic] will have a very good chance last year in the US Open. Was playing really well. Finally he [sic] lost in semifinals. Well see. She is No. 1 of the world. For sure the No. 1 of the world has chances to win the important tournaments. Q. You've won the US Open. Can you talk a little bit about the difference in conditions between this hard court tournament to the US Open and how do you play it differently tactically, or are they the same? RAFAEL NADAL: I play what I can. Every tournament is different. In every tournament you have different feelings. Even during the tournament you can change a little bit because your feelings are changing, no? So US Open was a really special tournament for me last year. In general, the conditions of Australia are a little bit more easy for me than US Open. The history says me that. The ball here is getting little bit more topspin, is a little bit slower. But seriously I start to think for me is better have faster courts or slower courts? Q. A couple of quite famous players this year have changed their racquet, have gone to a new company. You've always been with the same racquet people. How big a gamble is it to change your racquet? RAFAEL NADAL: Well, I have the option to do it a few years ago. But seriously I think is something difficult to do and is important decision because, yeah, maybe you win more money with another things, with a company, but if you lose little bit of your feeling and you lose little bit more than before, you are less happy than before. And is more important be happy than the money in general. That's what I feel. Q. Rafa, Novak said after the US Open last year that he was really impressed how much you improved your serve. Is there a particular area in your game you look to improve this year? RAFAEL NADAL: Always everything. But the serve, still to improve a lot. I think I am serving better, but never going to be enough, my serve. Everything. You can play more aggressive. You can play more inside the court. You can go more times to the net. You can return little bit more aggressive. You can play longer. You can play more close to the lines. In tennis you can improve all your career. So is something that I always tried when I wake up every morning and I go to practice. My goal is improve, not go to practice. That's why I am here, no? If someday I lost this feeling, maybe I don't gonna come back to this tournament. Q. Rafael, away from the tennis, not at the tennis courts, what is different about the Australian Open for you, outside the tennis? RAFAEL NADAL: I think the Australian Open probably is the easier Grand Slam for the players. The facilities are better than the rest of the tournament because you have everything very close, the hotel. The tournament always is improving, is creating new areas for the players. That's fantastic, no? I think is a tournament is improving more every year. So just we can say thanks to the tournament. Seriously, for me, with me, the organization, the director of tournament was always fantastic. Just can say thanks very much because the support, they make me feel like home. Is one of the tournaments that I am always very happy to be back. Q. You mentioned about your desire to keep improving all the time. Do you think because you and Roger have that mentality, you are taking men's tennis higher with you as well, that everybody now has to improve to even get close to you? RAFAEL NADAL: I don't know. I think every player improves normally because the player practice and the player keep improving I think all the career. So is important to know what you need to improve and how you gonna improve. So I think the important thing is keep focus, keeping have the right illusion and motivation to improve your tennis even if you are on the top. And I think that's why Roger is on the top for long, long time, no? Is almost 10 years in the top of the rankings. That's why I think he improved a lot these years. And myself I think, too. I can lose much more, and I can play a bad season this year. But I don't have any doubt because, win or lose, not depends only about how you play, depends about how you are mentally. Is a lot of facts can change between win or lose, no? But I (indiscernible) I am better player this one than three or four years ago. So that's something that is important personal satisfaction. That's why I am practicing every day.